For this project I was responsible for creating Manifesta's brand along with an identity for their community space, 'Festa. The idea of sharing and collaborating with the community are important values which we worked to communicate through the branding. The ellipses implies that Manifesta offers more than haircuts and beauty products. we aim to generate opportunities for mutually beneficial lines of revenue." Making sure 'Festa's relationship to Manifesta was clear we chose to use a similar badge with the same colors and font. To add to this we also stylized the word with an apostrophe at the begging to further illustrate 'Festa's relationship as a sub department of Manifesta. and also avoid the stigma of the term salon. 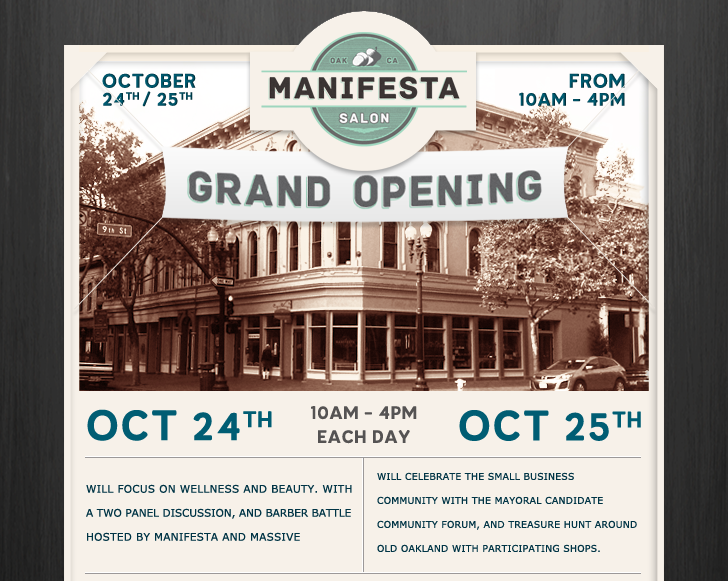 To address the first point we chose to use the acorn as a key design element, tying Manifesta to Oakland in a subtle and unique way. The use of this element and its placement in the branding would also allow for future adaptation if Manifesta expands into different communities. Since this would be a central element, and ideally one that could be used across many applications, the initial focus started here. For the second point we chose to go with a vintage industrial feel. We felt that this further tied the brand to the Old Town neighborhood where the shop is located, as well as giving the overall brand a bit of a masculine touch. This stage was primarily focused on the logotype and badge unit which would be the housing for the brand's elements. The final print materials included a full stationery set along with a menu of services, traditional business cards, and appointment cards. This process and the approved assets were wrapped up into a concise Brand Guide which address all of the elements for both Manifesta, and 'Festa, along with all colors, and fonts, and how they should be applied. The final stages of this project included creating a simple and clear website which acts as a blog to announce 'Festa events and partners, and also a quick way to shop services and book appointments. We also applied the logo to the storefront with an etched corner window which is highly visible from Oakland's Broadway St., and also working with a local carpenter to create a handcrafted wood sign for outside of the building.